Announcement: York Team Wins Osgoode Cup Undergraduate Mooting Competition by Virginia Corner Communications Manager Osgoode Hall Law School. York University students Ali Ayoub and Domenic Bianchi were the winning team in the inaugural Osgoode Cup Undergraduate Mooting Competition held over the weekend of March 5 and 6 at York University’s Osgoode Hall Law School in Toronto. Ten four-member teams of undergraduate students from a number of Ontario universities participated in the Competition, which was sponsored by the law firm of Beard Winter LLP. York students Navdeep Gill and Gurpreet Singh, who were members of a joint U of T/York team, placed second. Two teams tied for third place: Manraj Rai and Gurminder Singh from U of T, and Katie Mahon and Jeff Culp from Carleton. Ayoub, 21, and Bianchi, 22, were also named top oralists, along with Jeff Culp of Carleton, Dihim Emami of U of T, Navdeep Gill of U of T, and Daniel Vertlieb of Queen’s. The Osgoode Cup is a fun way for students with an interest in law to get a taste of what it is like to act as lawyers in an appeal before real judges. A “moot” is a mock legal proceeding in which students argue an appeal in a case specially designed to challenge and develop their oral and written advocacy skills. This year’s case dealt with the responsibility of social hosts when their party guests consume alcohol and Injure unrelated/innocent third parties. “It was an awesome experience,” said Ayoub, a third-year psychology student at York who is also a member of York’s Pre-Law Society for undergraduate students who have an interest in law. “I definitely recommend the competition to anyone considering law or interested in public speaking.”. For Saturday’s two preliminary rounds, judges included upper-year Osgoode students, Osgoode faculty members and members of the Ontario Bar. As well, Osgoode alumni served as coaches for each team. For Sunday’s semi-final and final rounds, the judges were Madam Justice Rose Boyko, Madam Justice Andromache Karakatsanis and Madam Justice June Maresca of the Superior Court of Justice of Ontario; David Jarvis, a partner with Beard Winter; and Osgoode Dean Patrick Monahan. In 2006, the Osgoode Cup will become a national competition and, thanks to the generosity of sponsors, students from outside Ontario will receive travel bursaries to enable them to participate in next year’s competition. Katie Mahon (left) of Carleton University; Madam Justice June Maresca; Dean Patrick Monahan; and Jeff Culp of Carleton. 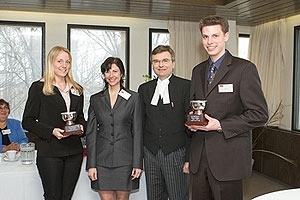 Mahon and Culp tied for third place in the Osgoode Cup Undergraduate Mooting Competition. 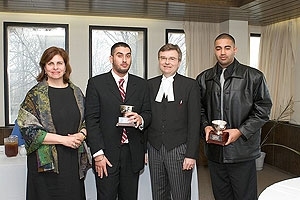 Left to right: Madam Justice Andromache Karakatsanis; Manraj Rai of the University of Toronto; Osgoode Dean Patrick Monahan; and Gurminder Singh of the University of Toronto. 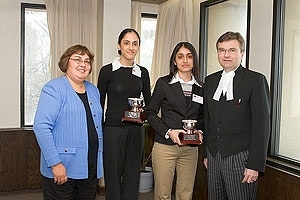 Rai and Singh tied for third place in the Osgoode Cup Undergraduate Mooting Competition. 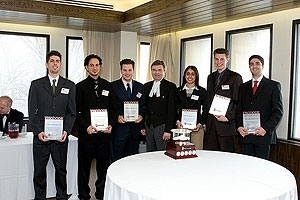 Top six oralists in the Osgoode Cup were, left to right: Domenic Bianchi of York, Ali Ayoub of York, Daniel Vertlieb of Queen’s, Osgoode Dean Patrick Monahan, Navdeep Gill of York, Jeff Culp of Carleton, and Dihim Emami of the University of Toronto.